. :: Oliver Capital Management, Inc. Institutional Services ::. 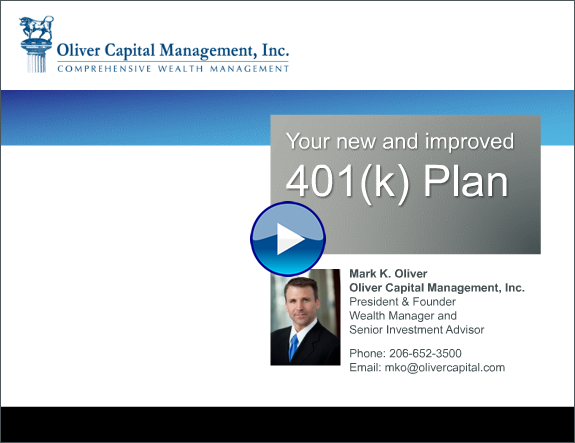 Oliver Capital Management is an Investment Manager and Fiduciary providing strategically engineered, properly diversified model portfolios for use in retirement, ERISA-qualified and defined contribution plans. Our model portfolios are systematically designed to offer risk-adjusted returns over the long term while reducing costs. Our services also include the formal, written assumption of fiduciary duties per ERISA 3(38) and 3(21), and other related solutions for retirement and ERISA-qualified Plans, Endowments, Foundations, Municipalities, and other Institutional Investors. As a related service, we also review and negotiate your fees and services with trustees, record keepers and administrators - according the plan the benefit of best industry practices at reasonable and competitive fees. The information contained herein should not be construed as personalized investment advice. Past performance is not a guarantee of future results. There is no guarantee that the views and opinions expressed in this email will come to pass. Investing in securities of any nature involves gains and losses and may not be suitable for all investors. Information contained herein is subject to change without notice and should not be construed as a solicitation to buy or sell any security.